East Lothian has joined the Meeting Centres Support programme. Over the next few months, we’ll be working with Friendship Groups and local communities to explore how the Meeting Centres approach works for East Lothian, building on and supporting great work going on across the county. What is a Meeting Centre? Meeting Centres are a local resource, operating out of ordinary community buildings, providing warm and friendly expert support to people living at home with dementia – that’s people with dementia and their families and friends. At the heart of the Meeting Centre is a social club where people can meet to have fun, talk to others, and get great help that focusses on what makes life great. Meeting Centres started in The Netherlands 25 years ago and are now operating across Europe. 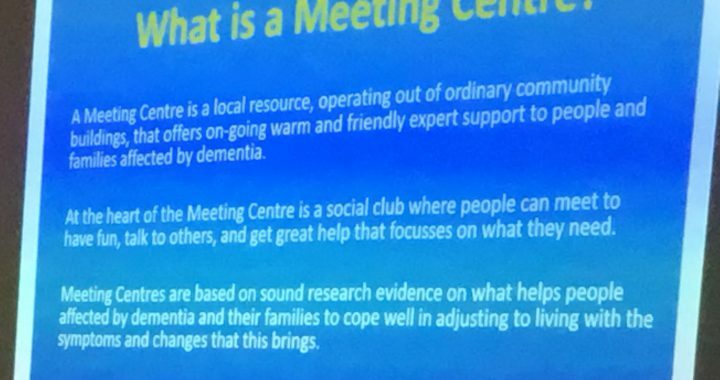 Research shows that Meeting Centres can help people with dementia and their family/friends and carers adjust to life with dementia to feel more positive, connected and better able to manage life with dementia. Meeting Centres are an important way of keeping active and feeling supported to manage the cognitive, emotional and social challenges of living with dementia. They provide accessible support and information at a local level. If people make good emotional, social and practical adjustment to dementia early on, then it is likely that they will experience fewer distressing symptoms later on and will be able to be supported to live at home for longer with a good quality of life for them and their family. Well-designed and clearly structured support can help maintain the psychological health of carers and mean if people with dementia do have to go into care this happens later. 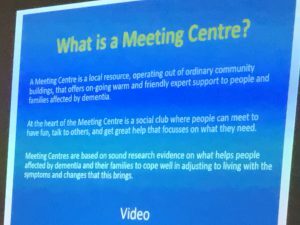 The idea for Meeting Centres came from research showing the positive effects of psychosocial interventions for people with dementia and gaps in care for people with dementia and their family members living in the community. These gaps weren’t just about practical help, but also the need for emotional and social support and in receiving reliable information at the right time. Families and friends often struggle with caring and need support for their health too. Often they want to know more about dementia. Social isolation, loneliness and stigma are commonly linked with living with dementia whether you have dementia or are a carer. We deal with dementia together – as families and friends – and we all need support and help and companionship. 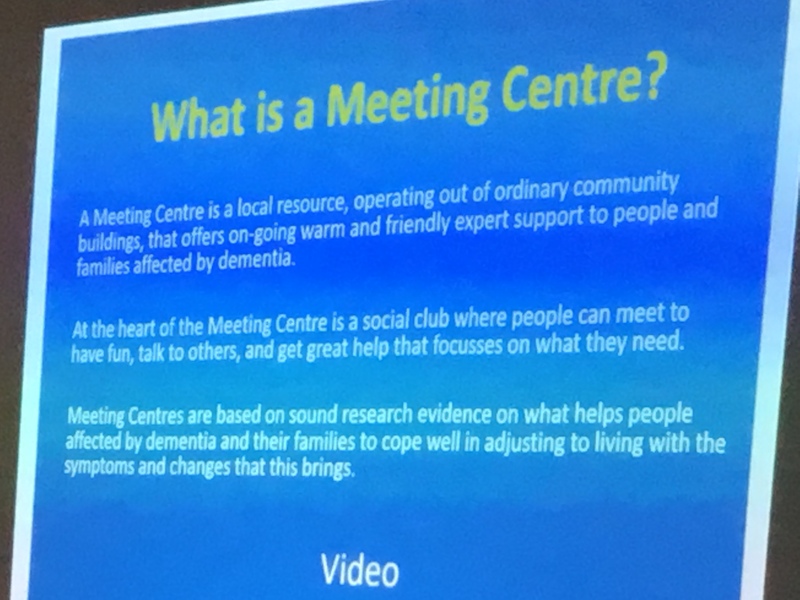 Research on the first Meeting Centres was very promising: family carers felt more competent to provide care for their loved ones and experienced less strain, people with dementia felt happier, became more active and developed new friends in the meeting centres. Participating in the centres’ programme even resulted in less nursing home admissions. Now, more than twenty years later, the Meeting Centres are spread across the Netherlands and each day serve more than 2000 people with dementia and carers. People feel respected and supported in living with dementia, they enjoy the indoor and outdoor activities the centres offer, they appreciate the friendships they make, and above all that they can be themselves in the Meeting Center. The first UK Meeting Centres started in Droitwich Spa and Leominster and are now being developed by Professor Dawn Brooker, Dr Shirley Evans and colleagues from the University of Worcester. How will Meeting Centres work in East Lothian? Making Meeting Centres work in different countries and communities means working with the difference and diversity of different communities and cultures – everyone does it differently. At the Gathering in October, we held 2 Pioneer Workshops and agreed that we already have centres and groups for people with dementia and carers running across East Lothian that are or could be Meeting Centres. Others thought Meeting Centres could be discussed in their community. We are talking with Friendship Groups across East Lothian about how Centres might work for them and are inviting local groups, individuals and organisations to join us at our December Christmas Friendship Groups in Haddington, North Berwick, Musselburgh and Dunbar. Other meetings can be set up on request. We will meet again in mid March 2019 with Dr Shirley Evans from the Meeting Support Programme to take the next steps. What is the Meeting Centres Support Programme? The Meeting Centres Support Programme offers support to groups and communities in different ways. We have already held the first Pioneer Workshops in East Lothian on 10 and 11th October.